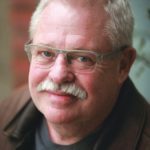 Armistead Maupin is an American writer, best known for his Tales of the City series of novels, set in San Francisco. Maupin was born in Washington, D.C., to Diana Jane (Barton) and Armistead Jones Maupin. Soon afterwards, his family moved to North Carolina, where he was raised. He says he has had storytelling instincts since he was eight years old. He attended the University of North Carolina at Chapel Hill, where he became involved in journalism through writing for The Daily Tar Heel. After earning his undergraduate degree, Maupin enrolled in law school but later dropped out. "I haven’t lost faith in human nature and I haven’t decided to be less compassionate to strangers." "But I’m acutely aware that the possibility of fraud is even more prevalent in today’s world because of the Internet and cell phones and the opportunity for instant communication with strangers." "But it’s amazing how many people think that gay men should slink off into the shadows when it comes to having friendships with children."